Click here to check the full list of Macros available on this website. Specific instructions below. Click here to jump to it. This article addresses all versions from Microsoft® Office 97 to Microsoft® Office 2010. Office XP and Office 2003 - Macros are completely disabled by default, unless the macro file is signed by its Author. 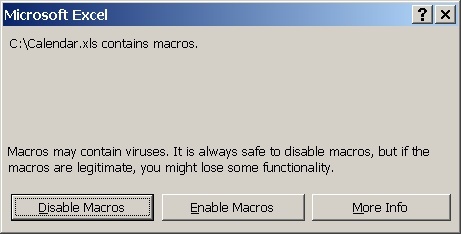 In this case, the user can decide (on the warning message) to run or cancel the Macro. On a more permanent basis, the user can change the macro security settings to allow the running of unsigned Macros, with or without warning. Office 2007 - Files with macros will always open but with macros disabled. You can enable the macros to run after the file is loaded. 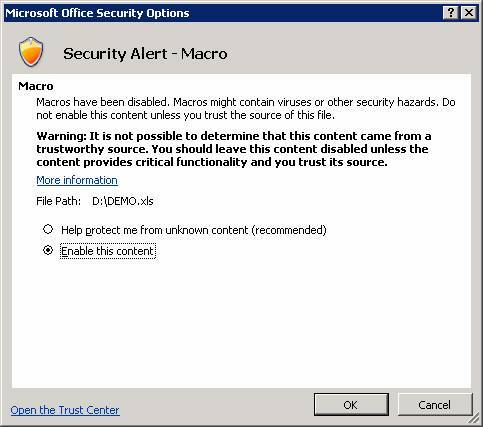 Given that most users have one of the 3 latest versions of Office, and macros don't run by default on them (at least without a warning), Office macros aren't currently the preferred platform for virus. But the latent danger remains. What can you do to enable the running of Macros? If you have any need to run Macros and find that they are disabled, you can activate them following some easy steps. 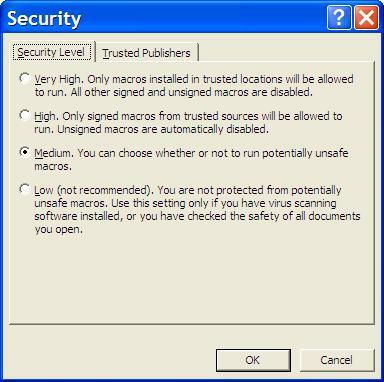 Never change the Macro security level to "Low", as it will enable the Macros to run without any warning. Change it to "Medium", where each time you open an Office file with a Macro, you will be prompted to allow its execution. This steps have been recorded using an Office 2000 version of Excel, but should be valid to all office applications and versions from Office 2000, aesthetics apart. So even if it looks a bit different, the mentioned menus and dialog boxes should be there (if not press here) . 2) To run unsigned macros under specific permission, like the ones currently provided by www.officehelp.biz, select the Medium option. You will be prompted every time you run a file with a macro for permission toe execute the macro. The default (High) will only run signed Macros, that some providers supply, and only after permission. Never choose the "low" option. Press OK to save. What if the menus or options are not there? If you can't find the mentioned menu entries on your Office 2000 / XP / 2003 then it is possible that the Office Macros functionality is not installed. Get the Office installation CD and install the missing components. If you're using Office 97, the activation of the Macro security options was on the "Options" entry of the "Tools" menu. Office 2007 has a completely new interface, based on the new "Ribbon" instead of the classic Menu / Toolbar set. The handling of macro security is also different and based on a different principle. Files with macros will always open but with macros disabled. You can enable the macros to run after the file is loaded. 2) Click the "Options" button and a pop-up windows will be shown. Select "Enable this content" and click "OK" to enable the macros. 3) Use the macro. There is NO NEED to close and reopen the file. 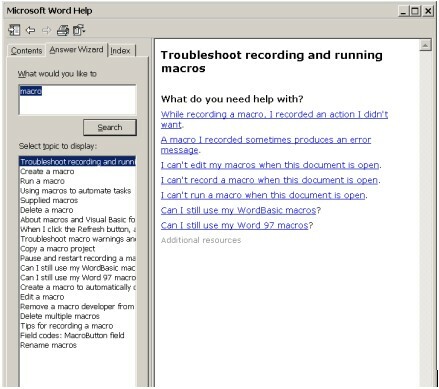 Office 2010 interface is similar to Excel 2007 but there is a difference in the way macros are enabled, with a single click needed. Files with macros will always open but with macros disabled. You can enable the macros to run after the file is loaded. The configuration of the Office applications installed on corporate computers is usually defined centrally by the IT team: users may or not be allowed to change them. If the configuration is locked, you won't be able to change it because the options don't work or are not available on the menus. If this is your case, you do need to contact your IT support staff to enable Macros on your system. They will probably demand a valid working reason to do so and may want to try and test the Macros you intend to run. Macros supplied by OfficeHelp.Biz are all safe and can be checked by the IT department for safety before being used on any computer. Can I get extra information on this subject? The Help file on any of the Office applications should have detailed information on Macros. Open help (using the Help menu or pressing the F1 key) and search for Macro, as on the following picture.